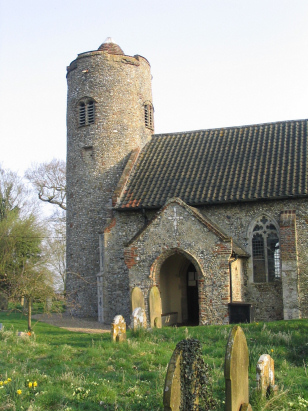 Hemblington parish is a small settlement just east of the city of Norwich and north of the main A47 road between Norwich & Great Yarmouth. The parish is sparesly settled with just a straggle of farm-houses with no real centre. 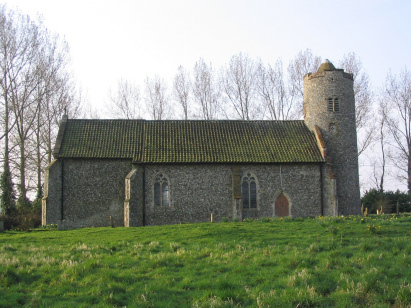 All Saints church sits beside a lane just north of Hemblington Hall, it is an interesting example of a round-tower church, usually indicative of an early date. At some time the tower was probably higher and this has fallen or become dangerous as a somewhat hidden conical top now caps the tower. Despite the round-tower most of the church dates from the early 14th Century. These records were transcribed from microfiche 3 and 4 in the collection of the Norfolk Record Office. These fiche represent quite an old filming and are consequently not to present filming standards. However the entries are mostly reasonably clear and it is only the vagaries of handwriting which would result in errors occurring.